The battle to be the next taoiseach has come down to Leo Varadkar and Simon Coveney as both camps put on a show of strength on day one of the Fine Gael leadership contest. 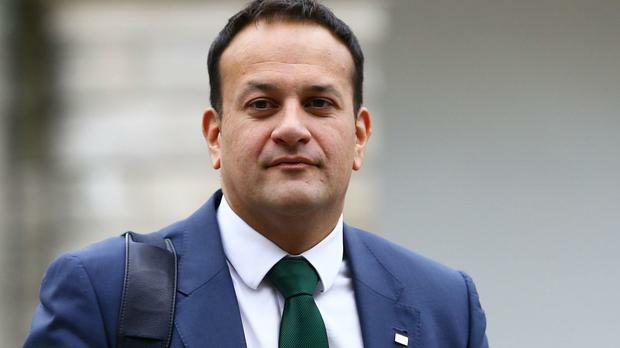 While Mr Varadkar is expected to personally launch his bid on Saturday, Mr Coveney fired the opening salvo on the steps of his party headquarters and declared he was not going to engage in sound bites and glib put-downs. "For me, I'm in politics to be positive and constructive," he said. "I want to lead a party and a country that can heal many of the divisions that have opened up over the last decade or so." The two challengers were left to fight it out as Justice Minister Frances Fitzgerald and Education Minister Richard Bruton ruled themselves out of the race. Mr Bruton declared his support for Mr Varadkar, as did Jobs Minister Mary Mitchell O'Connor, and those endorsements are expected to be backed by several other cabinet members in the coming days. Others in the ministerial ranks to back the Social Protection Minister were Joe McHugh, Minister for the Diaspora and International Development, who joined Mr Varadkar in Gweedore, Co Donegal, last weekend, and Eoghan Murphy and Sean Kyne. Helen McEntee, another junior minister in Mr Varadkar's camp, said: "Look at the fresh new approach he has taken to politics, look at how he interacts with people, look at his vision for a more forward-thinking and open Ireland. This country needs a leader for the 21st century and Leo is that person". On the other side of the battleline, Health Minister Simon Harris flanked Mr Coveney as he set out his stall. "Politics and society have become very fractured and Simon wants to reunite communities and reunite this country. That is precisely what we need right now and I believe Simon Coveney will deliver on this," Mr Harris said. The Coveney camp also made a big play on his own admission that he had asked to be Minister for Housing in the midst of an unprecedented homelessness and housing crisis. He set himself a deadline of the end of June to end the practice of putting up homeless families in long-term accommodation in hotels and B&Bs. There are still about 600 families in that position. Mr Harris added: "Simon Coveney certainly doesn't shirk challenges; he confronts them." Senator James Reilly announced he was stepping down as deputy leader of Fine Gael while plumping for Mr Coveney. Junior ministers Damien English and David Stanton are also in the camp. Mr Coveney denied that he has made any promises on cabinet jobs in return for support for his leadership bid and the TDs who came out gunning for Mr Varadkar also claimed they had been given no assurances. In the midst of declarations, Michael Noonan announced he would retire from politics at the next election. The Finance Minister said he did not want to be considered for another cabinet job and would not stand again for the Dail. "I believe now is a good time for a new finance minister to take up office. Ireland is the fastest-growing economy in Europe, the budget is almost balanced and we are on the cusp of full employment," he said. "I will continue to carry out my duties as Minister for Finance until a successor is appointed." Mr Kenny's successor is due to be elected by the parliamentary party, rank-and-file members and councillors on June 2 with the new leader to be voted in as taoiseach in the Dail in subsequent days. Mr Coveney's camp later claimed to have the support of 90% of the councillors in Cork and Kerry. The Fine Gael leadership is decided by an electoral college that gives the parliamentary party, made up of TDs, senators and MEPs, 65% of the vote. The rank-and-file members of the party have 25% and councillors 10%.